So here is how I see exposed zippers: exposed zippers are to fashion right now what bobby-pins and bra-straps were to the late-90s/early-aughts. Before that it was a major fashion faux-pas to show your bra-straps with your tank-top, or for anyone to see the engineering marvel that was holding your perfectly twisted hair in place. 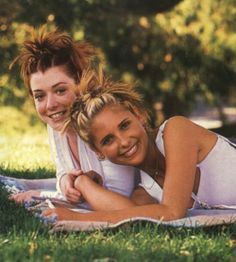 (Just ask Buffy and Willow!). Same goes with zippers: I remember the day -back when I worked in an office- when my colleague came to work in a mustard-yellow top from Anthropologie that had a toothy, exposed zipper in the back.....and I actually thought her shirt was on inside out! Ha! But now I love exposed zippers; they are an unexpected embellishment that give delicate pieces a bit of edge, casual pieces some added structure, and dressy pieces a hint of your secret identity as an international spy. At first glance, this satchel just seemed like your run-of-the-mill "OMG I must have it!" bag. BUT WAIT! This bag, by the Canadian spouse-team helming the brand Pixie Mood, is actually a cruelty-free vegan bag! Birds of North America was also one of my favourite brands to find at Nokomis. I love that the designs have that thoughtful, hand-made feel to them. Also, designer Haley Gibson's blog is refreshingly personal for a brand-blog. I love me a good tag! Ok friends, look closely at this pouch.....it's hilarious! This great dress from Anthropologie features another amazing back! I love Gentle Fawn, friends. First, what a great brand name! (It's up there with "Birds of North America", am I right?) I'm loving this great summer tank, complete with the Gentle Fawn brand-splotch and unique combined tank-top/halter-top straps! The lining! An overall thoughtfully made unique garment! Remember this one from our peek in the back-room last week? And a contrasting up-cycled Iowa State basketball shirt for the back! This hat has cute beading around the crown, and the scarf is silk and hand-painted by a local artist! This lacy top looks like a capelet, but fear not the strong breeze: there are sleeves and side-seams built in! As I was taking pictures this week I kept walking past this guy from last week. He still cracks me up! Look at his hilarious face! He's so annoyed! Talula shirt; Size S, $22. Laughing fit included! Well, well, well....a shirt with birds on it!